Fiona Clutterbuck thinks she’s got it all when she finally becomes Mrs Brian Goodchild, marrying weeks before her 30th birthday. But when he abandons her at the altar, she does the only thing she knows how to do, run away. Crashing the honeymoon camper van, she finds herself in the middle of nowhere on the west coast of Ireland with only the clothes she’s stood up in. So, if she’s not Mrs Brian Goodchild anymore, who is she? One thing she does know, she can’t go home. What Fi wants is to hide away, and where better? She takes a job on an oyster farm despite being terrified of water and her new boss, the wild and unpredictable Sean Thornton and his oyster broker partner Nancy Dubois. There, she battles oyster pirates, pearl queens and circling sharks before finally coming out of her shell and finding love amongst the oyster beds of Galway Bay. 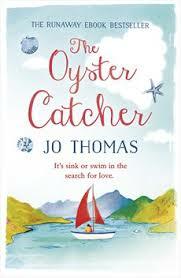 What a fantastic novel from Jo Thomas. The Oyster Catcher catches the atmospheric feel of Ireland. From page 1 the book had me hooked Jo has a wonderful writing style which just allows you to read the book with such ease and in fact I finished in just under 24 hours if time allowed I could of read in one sitting. The only thing I wasn’t sure on was the scenes with the locals I personally found them irritating and just wanted wanted to get back to being with Fi and Sean at the Oyster farm and the Oyster beds of Galway bay.